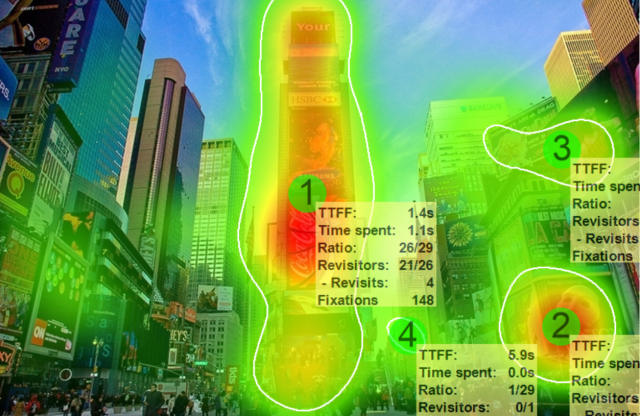 Eye Tracking is a tool for the analysis of visual attention. 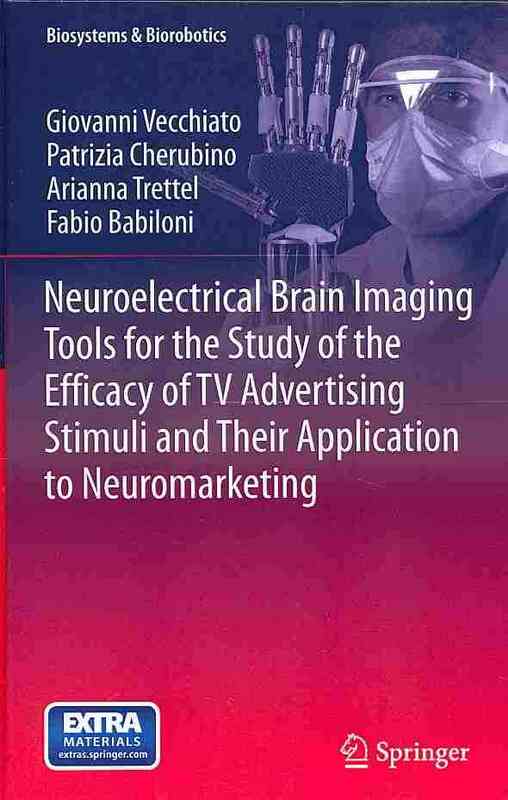 From the perspective of neuromarketing, it seeks to associate visual attention with the cognitive and emotional responses of consumers. This makes the measurement process more subtle, with very little or no interaction between the researchers and their subjects and this is what I like most about this technique. Eye tracking measures where the person is looking (named gaze or fixation point), the time that this person looked at this certain point, the movement of his eyes (and moreover, the sequence in which the eyes shift from one spot to another), pupil dilation, and the number of blinks. Understanding the mechanisms that guide consumers to select certain points of interest in an image have many applications for the business world and therefore, eye tracking can provide information on what is more relevant to the involvement of attention, as it is related to patterns of visual fixations. This is of inestimable value, especially for TV advertisements, in which lots of information is generated every millisecond, possibly hindering the identification of what the viewer really liked, or what actually called his attention in a positive or negative way. Here’s an interesting infographic created by iMotions that I would like to share with you: Eye Tracking Infographic. These measurements are possible due to special devices and software. For example, iMotions, a company that develops and markets biometric research platforms in order to enable researchers to execute multi-sensor human behavior research projects, offers both software and hardware solutions for both remote (desktop) and mobile (glasses) eye trackers, and also for other techniques. Built in stimuli presentation engine ensures automatic synchronization and easy study execution. Which eye tracker is right for you? Will your respondents be seated in front of a computer during the session? Go for a screen-based eye tracker. Do your respondents need to move freely in a natural setting or virtual reality? Choose a head-mounted system that allows for head and body mobility. Make sure the eye tracker you purchase meets the specifications required to answer your research objectives. Have a look at the key questions below that can help you find a suitable eye tracker. Even though less expensive, you rather stay away from eye trackers using ordinary webcams if you‘re aiming for high measurement accuracy. Measurement precision: Measured in degrees. Standard is about 0.5 degree. Low end hardware start around 1.0 degree, medium 0.5 degree, high end down to 0.1 degree or less (bite bar). Sampling rate: How many times per second is the eye position measured? Typical value range is 30-60 Hz. Special research equipment samples at around 120-1000+ Hz. Trackability: How much of the population can be tracked? The best systems track around 95% of the population, low end systems less. Headbox size: To what extend is the respondent allowed to move in relative distance to the eye tracker? A good system will typically allow to move around 11 inches in each direction. Recapture rate: How fast does the eye tracker detect the eye position after the eyes have been out of sight for a moment (e.g. during a blink)? Integrated or standalone: Is the eye tracking hardware integrated into the monitor frame? Standalone eye trackers are more flexible, but typically a bit more complex to set up. Software for data collection and analysis: Although some manufacturers offer integrated solutions, you will most likely have to export the raw data to a dedicated analysis software for data inspection and further processing. So which eye tracking software solution is the one you need? iMotions offers a single platform to integrate any time of stimulus with eye tracking and other biometric sensors without having to piece everything together. 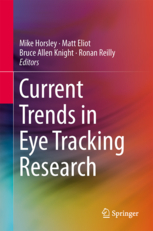 You will be amazed to see how many research papers featuring eye tracking research have been published – you get have a look here: Eye Tracking Publications. You can even see how Stanford University uses this for research: https://vimeo.com/111472276. 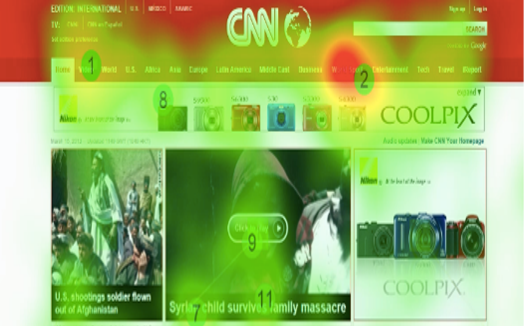 One emerging field using eye tracking as methodology is usability and user experience testing. Eye tracking data can deliver valuable insights into the gaze patterns of your website visitors – how long does it take them to find a specific product on your site, which kind of visual information do they ignore (but are supposed to see)? Similar applications can be applied to mobile apps on tablets and smartphones. Driving behavior research uses head-mounted eye tracking technology combined with a number of other biometric sensors in a virtual reality (simulator) to gain a better understanding of human behavior in hazardous situations while driving. Where do drivers look when they face obstacles on the street? How does talking on the phone affect driving behavior? How exactly does speeding compromise visual attention? Insights of that kind can help improve hazard awareness and, for example, be applied to safe driving trainings and the development of further electronic driving aids. Automotive research has embraced head mounted eye tracking for a long time to gauge drivers‘ visual attention – both with respect to navigation and dashboard layout. In the near future automobiles might be able to behave responsively toward drivers’ eye gaze, eye movements or the pupil dilation. How do expectations shape the way we see the world? Neuroscience and psychology utilize eye tracking to analyze the sequence of gaze patterns to gain deeper insights into cognitive processes underlying attention, learning, and memory. Another research strand addresses how we encode and recall faces – where do we look to extract the emotional state of others? Eyes and mouth are the most important cues, but there’s definitely a lot more to it. Finally, eye tracking provides insights into word processing, particularly how eye movements during reading are affected by the emotional content of the texts. What exactly does it take to turn learning into a successful adventure? Within the recent years, eye tracking technology has impressively made its way into educational science to help gain insights into learning behavior in diverse settings spanning from traditional „chalk and talk“ teaching approaches to digital learning. Analyzing visual attention of students during classroom education, for example, delivers valuable information in regard to which elements catch and hold interest, which are distractive or fail to be seen – do students read or rather scan slides? Do they focus on the teacher or concentrate on their notes? Does their gaze move around in the classroom? Eye tracking findings like these can be effectively leveraged to enhance instructional design and materials for an improved learning experience in the classroom and beyond. Eye tracking in combination with conventional research methods or other biometric sensors can help assess and diagnose neurological diseases such as Attention Deficit Hyperactivity Disorder (ADHD), Autism Spectrum Disorder (ASD), Obsessive Compulsive Disorder (OCD), Schizophrenia, Parkinson‘s, and Alzheimer‘s disease. Besides, eye tracking technology can be leveraged to detect states of drowsiness or support multiple other fields for medical use, quality assurance or monitoring. 6. Gaming and UX – how come eye tracking is the big hit among a growing number of web designers and developers? Eye tracking has recently been introduced into the gaming industry and since then has become an increasingly prominent tool as designers now are able to assess and quantify measures such as visual attention and reaction to key moments during game play to improve overall gaming experience. When combined with other biometric sensors, designers can utilize the data to measure emotional and cognitive responses to gaming. New trends and developments will presumably render it possible soon to take an active part and control the game based on pupil dilation and eye movements. Like no other experimental method, eye tracking renders it possible to quantify visual attention as it objectively monitors where, when, and what people look at. Without doubt, the terms fixation and gaze points are the most prominent metrics in eye tracking literature. 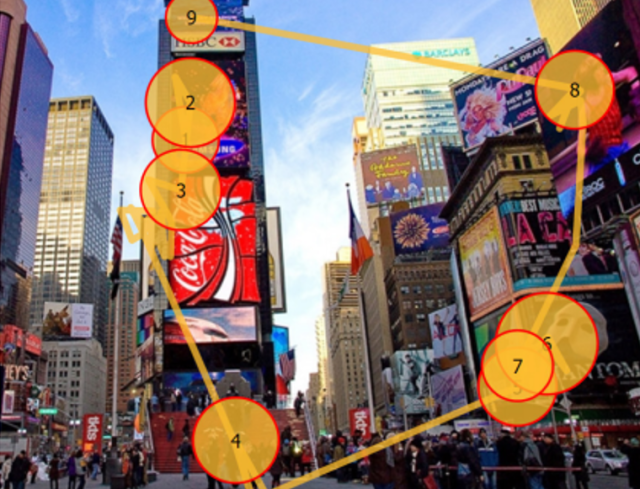 Gaze points constitute the basic unit of measure – one gaze point equals one raw sample captured by the eye tracker. The math is easy: If the eye tracker measures 60 times a second, then each gaze point represents 16.67 milliseconds. If a series of gaze points happens to be close in time and range, the resulting gaze cluster denotes a fixation, a period in which our eyes are locked toward a specific object. Typically, the fixation duration is 100 – 300 milliseconds. The eye movements between fixations are known as saccades. What are they exactly? Take reading a book, for example. While reading, your eyes don’t move smoothly across the line. Instead, your eyes jump and pause, thereby generating a vast number of saccades. The visual span refers to how much text we can cover between fixations – on average, saccadic movements span 7 to 9 characters along the line of text. Trained readers have a higher visual span compared to early readers. Typically, saccades are measured in angle velocity. Now imagine watching clouds in the sky as you pass your time waiting at the bus stop. Here, expect your eye movements to be quite the opposite as your eyes steadily follow the moving clouds. Unlike reading, locking your eyes toward a moving object won’t generate any obvious saccades, but a smooth pursuit trajectory. As fixations and saccades are excellent measures of visual attention and interest, research in this field is experiencing a significant growth. Heat maps are static or dynamic aggregations of gaze points and fixations revealing the distribution of visual attention. 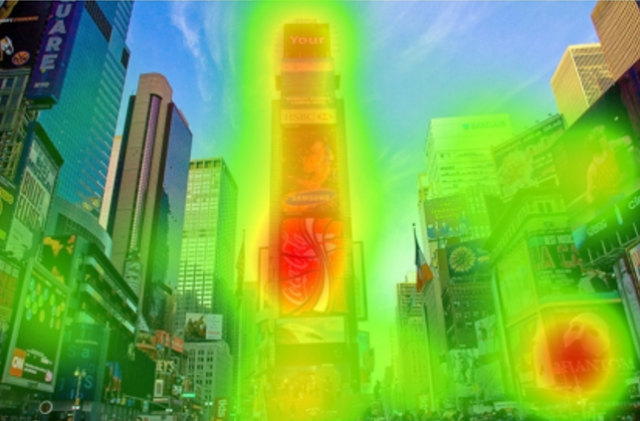 Following an easy-to-read color-coded scheme, heat maps serve as an excellent method to visualize which elements of the stimulus were able to draw attention – while red areas suggest a high number of gaze points and therefore an increased level of interest, yellow and green areas point toward flattening visual attention. Based on fixation position (where?) and timing information (when?) you can generate a fixation sequence. Dependent on where respondents look and how much time they spend, you can build an order of attention telling you where respondents looked first, second, third etc. This is a commonly used marker in eye tracking research since it reflects salient elements (elements that stand out in terms of brightness, hue, saturation etc.) in the display or environment that are likely to catch attention. AOIs which respondents look at first are typically visually more appealing (more salient) and are therefore of more interest. Areas of Interest, also referred to as AOI, are user-defined subregions of a displayed stimulus. Extracting metrics for separate AOIs might come in handy when evaluating the performance of two or more specific areas in the same video, picture, website or program interface. The time to first fixation indicates the amount of time it takes a respondent to look at a specific AOI from stimulus onset. TTFF can indicate both bottom-up stimulus driven searches (a flashy company label catching immediate attention, for example) as well as top-down attention driven searches (respondents actively decide to focus on certain elements or areas on a website, for example). 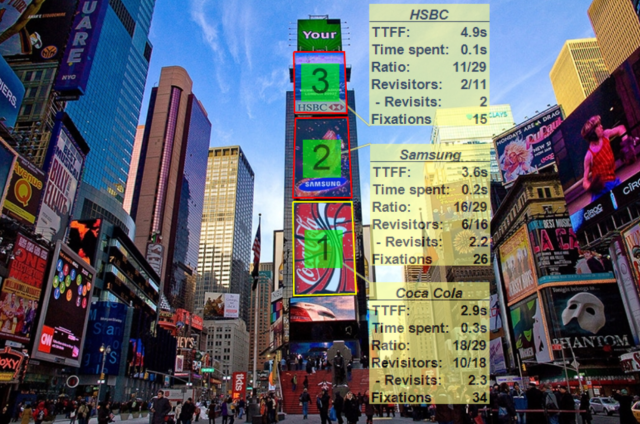 TTFF is a basic yet very valuable metric in eye tracking. Time spent quantifies the amount of time that respondents have spent on an AOI. Since respondents have to blend out other stimuli in the visual periphery that could be equally interesting, time spent often indexes motivation and conscious attention (long prevalence at a certain region clearly point to a high level of interest, while shorter prevalence times indicate that other areas on screen or in the environment might be more catchy). With the core tools at hand, you‘re perfectly equipped to track the basics. Where, when and what do people look at? What do they fail to see? Now how about pushing your insights a bit further and stepping beyond the essentials of eye tracking? Want to peek beneath the surface? Advanced metrics can help reveal emotional arousal and valence. These 4 eye tracking metrics should definitely make it into your toolkit so you can draw the bigger picture. Pupil size primarily responds to changes in light (ambient light) or stimulus material (e.g. video stimulus). However, if the experiment can account for light, other attributes can be derived from changes in pupil size. 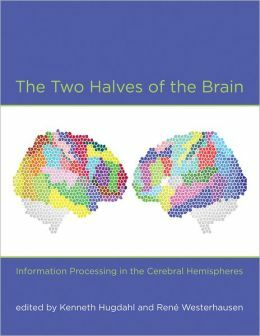 Two common properties are emotional arousal and cognitive workload. An increase in pupil size is referred to as pupil dilation, a decrease in size is called pupil constriction. In most cases pupillary responses are used as a measure for emotional arousal. However, be careful with rash conclusions as pupillary responses alone don’t give any indication of whether arousal arises from a positive („yay“!) or negative stimulus („nay!“). Along with pupil size, eye trackers also measure the distance to the screen and the relative position of the respondent. Leaning forwards or backwards in front of a remote device is tracked directly and reflects approach-avoidance behavior. However, keep in mind that interpreting the data is always very specific to the application. Most eye trackers measure the positions of the left and right eyes independently. This allows the extraction of vergence, i.e., whether left and right eyes move together or apart from each other. This phenomenon is just a natural consequence of focusing near and far. Divergence often happens when our mind drifts away, when losing focus or concentration. It can be picked up instantly by measuring inter-pupil distance. Advanced metrics can help reveal emotional arousal and valence. Eye tracking can also provide essential information on cognitive load by monitoring blinks. Cognitively very demanding tasks can be associated with delays in blinks, the so-called cognitive blink. However, many other assertions can be derived from blinks. A very low frequency of blinks, for example, is usually associated with higher levels of concentration. A rather high frequency argues for drowsiness and lower levels of focus and concentration. We could have used camera-based facial expression analysis to monitor your emotional valence. Each sensor reveals a specific aspect of human cognition, emotion, and behavior. Depending on your individual research question, consider to combine eye tracking with two or more additional biosensors in order to gain meaningful insights into the spatio-temporal dynamics of attention, emotion, and motivation. The true power of eye tracking unfolds as it is combined with other sources of data to measure complex dependent variables. These 5 biometric sensors are a perfect complement to eye tracking. ECG & PPG: Electrocardiography (ECG) and Photoplethysmography (PPG) allow for recording of heart rate (HR), or pulse. Get insights into respondents’ physical state, anxiety and stress levels (arousal), and how changes in physiological state relate to their actions and decisions. Facial Expression Analysis: Facial expression analysis is a non-intrusive method to assess both emotions (subconscious reactions prior to feelings – typically small movements in face muscles) and feelings (conscious reactions occurring after emotions – typically more visible muscle movements). While facial expressions can measure the presence (valence) of an emotion/feeling, they can´t measure the power of that emotion/feeling (arousal). EEG: Electroencephalography is a neuroimaging technique measuring electrical activity on the scalp. 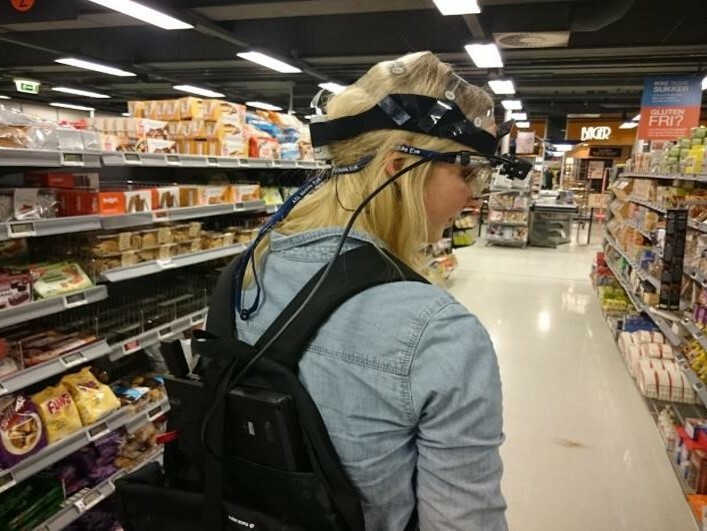 EEG tells which parts of the brain are active during task performance or stimulus exposure. 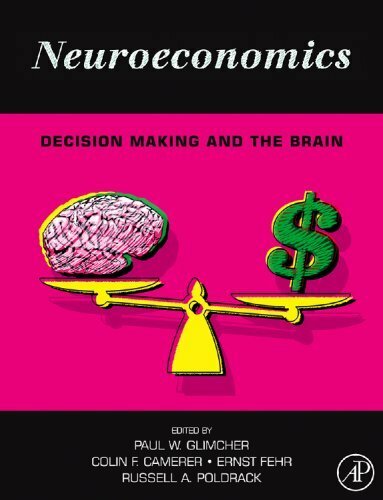 Analyze brain dynamics of engagement (arousal), motivation, frustration, cognitive workload and other metrics associated with stimulus processing, action preparation, and execution. EEG provides the quickest response of all biometrics sensors. GSR (EDA): Galvanic skin response (or electrodermal activity) monitors „emotional” sweat secretion on hands or feet. Skin conductance offers insights into the respondents’ subconscious arousal when being confronted with emotionally loaded stimulus material. EMG: Electromyographic sensors monitor the electric energy generated by bodily movements (e.g., of the face, hands or fingers). Use EMG to monitor muscular responses to any type of stimulus material to extract even subtle activation patterns associated with emotional expressions (facial EMG) or consciously controlled hand/finger movements. Eye tracking is about where we look, what we look at, how much time we spend looking at it, how our pupils react to different kinds of visual stimulation and when we blink. Put most simply, eye tracking refers to the measurement of eye activity, and technology nowadays allows us to use it in order to understand little by little how the human mind works.